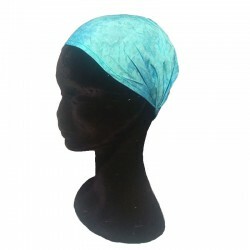 Zandana 100% light blue cotton and white pattern easy to tie on the head in a nice corsair style.Zandana scarf made in Nepal, ideal for protection from the sun, for the bike or motorcycle under the helmet. 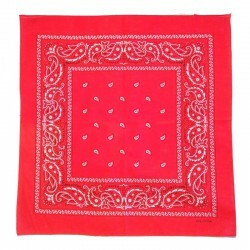 Red cotton bandana to wear around the neck in classic way or to tie on the head in corsair style.A nice fabric that will enhance your outfits by putting also on your wrists or ankles. 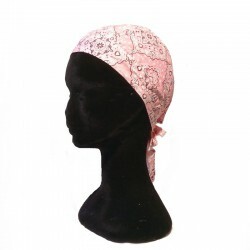 Lilac cotton bandana to wear around the neck in classic way or to tie on the head in corsair style.A nice fabric that will enhance your outfits by putting on your wrists or ankles. 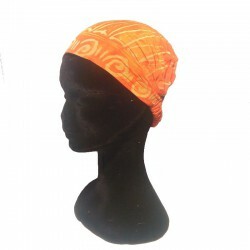 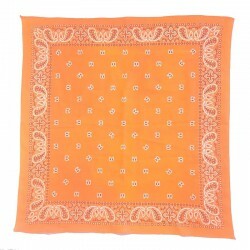 Fine cotton orange bandana with white paisley design, to wear around the neck like biker or to tie on the head in corsair style.A nice fabric that will enhance your outfits by putting also on your wrists or ankles. 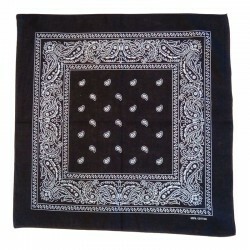 Fine cotton sand colored bandana with white paisley design, to wear around the neck like biker or to tie on the head in corsair style.A nice fabric that will enhance your outfits by putting also on your wrists or ankles. 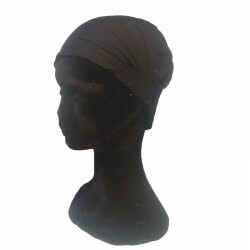 Headband 100% blue cotton with design, easy to put in totally covering the head in a pretty corsair style or only part to decorate your hairstyle.Headband made in Nepal, ideal for protection from the sun, for the bike or motorcycle under the helmet. 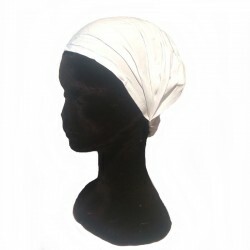 Headband 100% white cotton with elastic, easy to put in totally covering the head in a pretty corsair style or only part to decorate your hairstyle.Headband made in Nepal, ideal for protection from the sun, for the bike or motorcycle under the helmet. 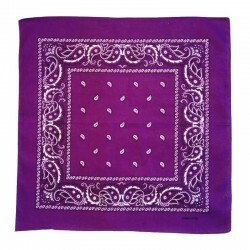 Purple cotton bandana with white paisley design, to wear around the neck like biker or to tie on the head in corsair style.A nice fabric that will enhance your outfits by putting also on your wrists or ankles. 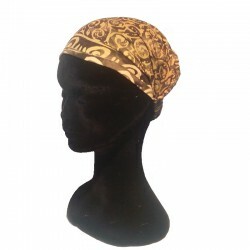 Headband 100% bronw-green cotton with design handmade in Nepal. 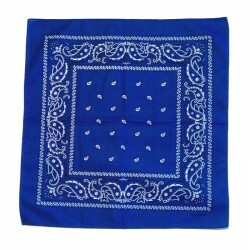 Midnight blue cotton bandana to wear around the neck in classic way or to tie on the head in corsair way.A pleasant fabric that will enhance your outfits as you wish. Headband 100% raspberry and pink cotton with design, easy to put in totally covering the head in a pretty corsair style or only part to decorate your hairstyle.Headband made in Nepal, ideal for protection from the sun, for the bike or motorcycle under the helmet. 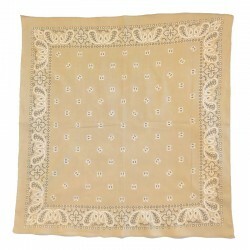 Fine cotton brown bandana with white paisley design, to wear around the neck like biker or to tie on the head in corsair style.A nice fabric that will enhance your outfits by putting also on your wrists or ankles. 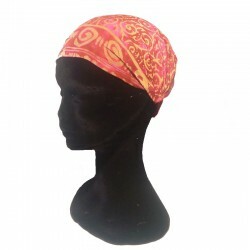 Zandana 100% pink cotton and white pattern easy to tie on the head in a nice corsair style.Zandana scarf made in Nepal, ideal for protection from the sun, for the bike or motorcycle under the helmet. 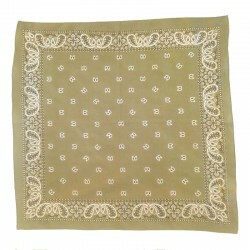 Fine cotton olive green bandana with white paisley design, to wear around the neck like biker or to tie on the head in corsair style.A nice fabric that will enhance your outfits by putting also on your wrists or ankles. 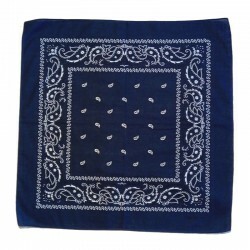 Dark blue cotton bandana to wear around the neck in classic way or to tie on the head in corsair style.A nice fabric that will enhance your outfits by putting also on your wrists or ankles.